Getting a self-inflating air pad can be a great option for those people that are looking for a way to quickly and effectively get a sleeping space set up. Getting the best self-inflating air pads for your situation will involve some look at your situation and figuring out what you’re going to do with the air pad. The most common place where a self-inflating air pad is used is camping. This doesn’t have to be the only use for it, but it is the most common. So when you’re looking for an air pad that self-inflates, you will often find it listened in outdoors sections of websites and stores because that is where most people are taking them. However, even if you are using it just the mat for a surprise guest, you’ll want to get the best self-inflating air pad possible. Three thickness options - 1.5", 2" & 3"
Long: 25" x 77", Full: 20" x 72"
There are a number of things that you will want to think about when you’re looking at a self-inflating air pad. These factors will change depending on the needs you have and where you’re going with your air pad. But these should help you find your way to the best self-inflating air pad. The thickness of a pad will change how comfortable it is to lay on. It will also have an effect on how insulted you are from the floor. The thickness that you want and need for your trip will depend on the camping or wherever else you’re going to use the air pad. The thicker the air pad, the more comfortable you will be. However, this does mean that you will have to pack it into whatever you’re taking with you. Your air pad may fold up to a smaller size, but a thicker air pad will still take up quite a bit of space when uninflated and rolled up. The material of the inside of the self-inflating air pad can contribute to the thickness and how insulting it is. If there are larger pockets of dead air, then they’re going to be thicker and more comfortable. However, you might not need the thicker air pad. This will depend on where you’re camping and what time of year you’re planning on camping. If you’re planning to be in areas that are colder, then you should opt for a thicker air pad and thus the open-cell might be the better option. Closed cell air pads are going to be a little thinner and a little easier to pack. The quality of the material that you are using will also change the insulating factor of the air pad. A cheap thick one might not be as insulting as a more expensive higher quality slightly thinner air pad. So you’ll want to be careful when you’re picking out a self-inflating air pad. Another major factor is the outer fabric. This will depend on where your self-inflating air pad is going. The outer fabric might need to stand up to some more wear and tear of the situation. If the self-inflating air pad is going on a cot or somewhere that’s not the bare ground, then you might be able to get away with a fabric that is a little less sturdy. However, this does mean that you should necessarily opt for just the cheaper one. You never know when you’re going to be using your self-inflating air pad. Having a sturdier one will help you regardless of the situation that you find yourself in. The size of the self-inflating air pad will be something you will definitely want to take into account. While most of them are designed for only one person, there are several length and width choices that you can opt for. The option that will work best for you depends mainly on what you’re doing and who you are taking with you. If you are going with a sibling or significant other, you might be able to get a slightly wider one as long as you don’t mind packing it up. That’s the major downside to getting a self-inflating air pad that’s larger, how to pack it up. Packing up a larger air pad means more weight and a bulkier pack. If you are hiking somewhere far away, then you might want to opt for a thinner and smaller one, even if that means you’re getting two of them and splitting the weight between multiple people. The price of the pads will really be a major factor. This will inform the materials that you look for in an air pad and even the thickness. The price will depend largely on what you want to do. If you’re serious about camping, then you might be willing to put all that extra money into the air pad. However, if you’re only planning to use it for one or two trips, then you won’t need the most expensive mat out there and it might serve you better to get one that is a little bit cheaper. There are a lot of different extras that you can get in the self-inflating air pads, but what features you really want will depend on your budget and the way that you like to camp. You might need straps to secure the air pad to a cot if you are using it with a cot. For carrying, you might want a bag to put it in or a set of straps to wrap around it. These features can make sure that you are better able to transport the pad wherever you are going. However, these features might not be entirely necessary. This will just depend on what you need. You may also want an air pad that has a reinforced bottom layer. This can be especially helpful if you know you are going to an area where the ground is really rocky and you don’t want to worry about your air pad puncturing. You might also be interested in an air pad that has multiple air chambers. These air chambers will allow you to really get a better night’s sleep. You can inflate some air chambers more than others and customize the sleep experience that you are having. This can be great for people that need some support in some places more than others. In addition to having separate chambers, there might also be a built-in pillow that you can use. This pillow will mean that you’ll have a little more modern comfort than you would have otherwise had. Most of the time, these pillows actually make packing easier. It means that you won’t have to pack something else into your bag. Going camping with a self-inflating air pad is a great way of making your camping trip a lot nicer. You won’t be sleeping almost directly on the ground and it’s a little nicer than a thin mat. The mat may be able to stand up to a lot, but it also won’t provide the same kind of comfort that you can get with the self-inflating air pad. While you might think of using a more typical air pad first, a self-inflating air pad may be better for you than you think. You won’t have to bring a pump with you and you won’t have to bring extra gear with you. Instead, you can easily use the self-inflating air pad for a more space effective sleeping space. Rather than a typical air pad, the self-inflating air pads are typically made to be slightly narrower and shorter. This means that you’ll be able to fit onto the air pad without worry. Camping with a self-inflating air pad can make sure that you are having the most comfortable sleeping experience when you’re out in the woods. And it also means that you won’t have to log around a bigger air pad and a pump in order to set up your tent. This can be great for people that want to go far distances and don’t want to fuss with too much extra stuff. When backpacking anywhere, you will find that there’s a lot to consider when you’re packing up that bag. You won’t have a ton of extra space in the bag for all those extra things, so you’ll have to find a way to get the modern comforts out of your backpacking set up. You can get backpacks that you can fit a lot of stuff in, but you are still going to have to deal with the limited weight that you can carry. When you are backpacking, you want something that is light. The way that self-inflating air pads work makes sure that your air pad is light and easy to use. This means that you’ll be cutting down on weight in your bag by not needing a pump or having extra material. The self-inflating air pad is also perfect for backpacking because it lets you have a little more comfort while you’re out in the wilderness. You won’t have to just sleep on the ground. This will make sure that you’re insulated and also comfortable from the rocks and uneven ground. This will really make sure that you’re not getting the terrible sleep out in the wilderness while you’re hiking. Backpacking can be incredibly rewarding, but you’ll want to make sure that you make sure that you’re getting the best sleep possible. When you’re looking for self-inflating air pads, you’re going to have a harder time finding one that is king sized. You can find air pads with built in pumps that you can use, but you may not find an air pad that will inflate without something helping it to inflate. If you want to make a sleeping surface that is a little bit larger, there are slightly sider air pads that self inflate, but you will also find that there are other options. For you to consider. You may want the larger area because you will be camping with someone else. In order to put this together, you will need a couple of self-inflating air pads. This can work well when you’re on a relatively flat spot. However, if you are on a tilted plane, then your air pads might slip and slide around on the inside of the tent. This is something that you should be aware of. However, you won’t be able to get a self-inflating air pad that is king sized. It would be too large to conveniently roll up into your bag for the most part. However, using some combinations of smaller air pads and some creativity, you’ll be able to combine things and turn multiple air pads into a nice sleeping surface. When you look away from just the self-inflating air beds that you can roll out and open a valve on, then you might find yourself finding some interesting options with air beds that have legs. These air beds typically use pumps, but they come with legs that help elevate the air bed up and off the ground. This can be a great change of pace because it makes sure that you’re away from the ground and can make sure that your sleeping surface is more stable and comfortable than it would have been otherwise. The biggest downside to getting these kinds of air beds is that they are fairly expensive. That is because of all the technology that is built into the air bed. However, if you want the most comfort, then you will want this kind of air bed. Getting an air bed with legs may not be the best choice for you if you are planning to hike long distances with the air bed. The legs will make the air bed so much bulkier which can really cause problems when you’re trying to get your pack ready. The weight would just be too much for someone that has to carry it for days and days. You would need to pack food and the air bed might take up too much space. However, if you’re not going that far or are camping near your car, then you’ll definitely be able to use an air bed that has legs. It can work really well then. Getting a self-inflating mat is one of the more typical ways that people get equipment for camping. They are more compact and easier to carry with you. This can make them easier to pack up into your bag when you’re going on a longer trip. However, if you are struggling to find a self-inflating mat that is working for you because of how thin they tend to be, then you will want to go with the air pad option instead. The air pades will be thicker than the mats which means that you will be higher up off the ground. This will make sure that you aren’t touching the ground. The air pad will give you a more even surface and there are even models that are built to be a little sturdier. However, while air pads provide more comfort, the mats are a little easier for camping. There are more options when it comes to what you need for camping. You’ll be able to find options that will work fantastically for camping and won’t take up space. The air pads can come with built-in pumps, but you will find that they need power which means that you will either need a generator or a pump that is outside of the air pad. With the self-inflating mat, you won’t need that extra technology. This means that your pack will weigh less. 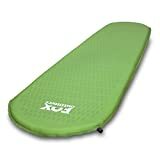 However, the air pad is typically suited to less demanding places or shorter hiking and camping trips. 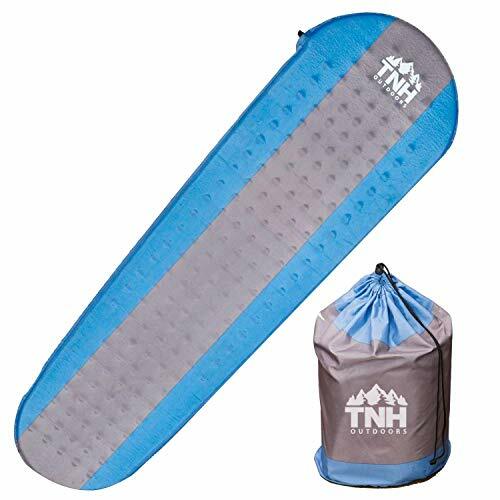 The TNH Outdoors brand makes tons of different comfortable items that you will be able to use on your next camping trip. They have air pads, hammocks, and plenty of other objects. The company is newer, but that doesn’t mean that they don’t know what they’re talking about. This particular pad is made to fold up tightly, which means that you won’t be wasting any space in your pack. 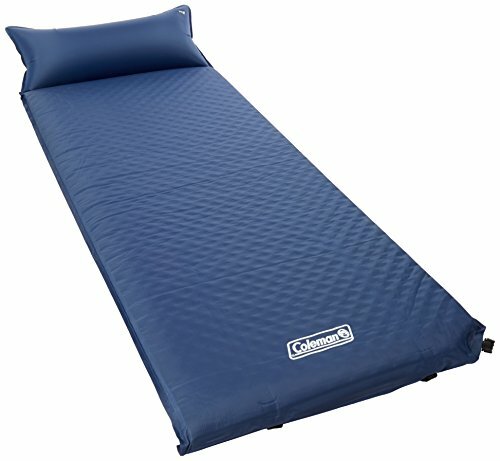 This self-inflating air pad also has plenty of length when it’s unfolded and inflated to make it reasonable for you to sleep on. In fact, it will be incredibly comfortable according to most people that use it. There are slightly lighter air pads out there that can self-inflate, however, the comfort of this one makes up for the extra weight that it may have. Some people may not be able to see just how comfortable this pad is because they aren’t used to using pads out in the woods; however, the more experienced campers will be able to tell just how great this one is. As it is also less expensive, the pad will be great for people that are on a little bit of a tight budget but don’t want to sacrifice their comfort. Lightspeed Outdoors creates tons of products to make camping trips easier on people. They make tons of products including pads and larger air pads. While they might not be the main focus, their products are made to make your life a little bit easier while you are out in the woods. This particular version of this pad is 1.5 inches thick. There are thicker versions of this particular air pad, so if you need something that is a little bit thicker, you will be able to find an option here. However, the thicker the air pad the wider it is as well. The dimensions of the air pad change a little bit as well with the different models. This air pad has a built-in pillow. However, the pillow is a little bit different than other models. Instead of having a pillow that you have to manually inflate that may not be that comfortable, the pillow in this model is part of the main part of the air pad. This means that you won’t have to do anything extra. This also means that it won’t be as full as another built-in pillow. You may still want to bring a pillow for this air pad if you like having a fluffier space when you’re sleeping. Because of its thickness as well as all of the length, this self-inflating air pad may be a little bit thicker than you would like when it is rolled up. However, the comfort that it can provide will be worth that little bit of space in their pack. Coleman is a brand that has been around for years making all sorts of products that are meant to make your life so much easier. This eventually turned into their focus on products in the outdoor areas. This means that the products that they make come from a long line of products that are meant to improve your life. If you don’t want to have to take a pillow with you while you are camping, then you will definitely want to check out this air pad. This oneself-inflatess the main section and then you will have to inflate the pillow as well. While having a pillow may seem a bit silly to some, it can save on precious space that is in the pack that you are taking with you. Also included in the air pad are built in straps. While some people might have issues with the straps eventually falling apart, the straps can still be incredibly helpful. This can mean that you won’t have to find another way to make sure that everything stays together. This makes sure that your pack stays secure and easy to organize. his might not be a huge deal for people that are sleeping in their car, but this can be incredibly important for people that are out in the wilderness and this is all that is separating them from the ground. Fox Outfitters is a company that specializes in hammocks and other ways to sleep outside. Their focus has been on providing quality sleeping spaces for you. However, that quality doesn’t come cheaply. You’ll have to be ready to pay a little bit more money in order to get the higher quality sleep experience. This air pad is pretty simple. And while that might seem a little bit annoying since the air pad is quite a bit of money, you’ll have to consider the materials that make up this particular mat. This air pad has a lot of great materials inside and outside of the pad. The outer materials will be very resistant when you’re camping somewhere that’s a little rougher. The inner material makes sure that you have a comfortable night of sleep. While the amount that you’re paying for it might seem a little overkill, this is a self-inflating air pad that will really stand up to the elements. 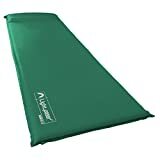 This air pad will be good for someone that goes camping on a regular basis and needs something that will work with their pack and not against them. This can make a great gift for the camper in your life or it can be perfect for yourself if you’re the one that likes to camp a lot. 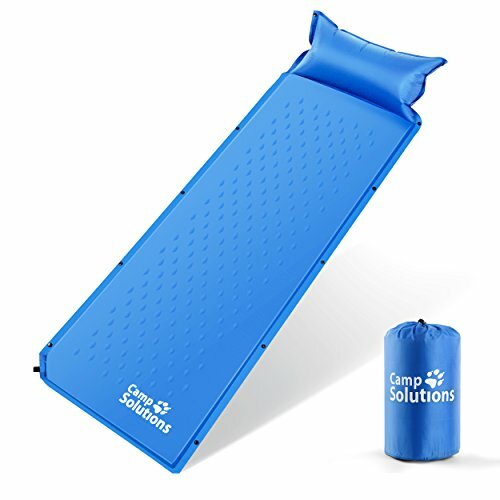 Camp Solutions is an online company that sells many different products that are convenient when you are trying to camp. They are less well known than other companies, but their products are reasonably priced, so they might be interesting to you. This particular self-inflating air pad is a little bit thinner, but that doesn’t mean that it’s not good. This may be better for people that want something that will fit in their pack. This pad will be able to work well with whatever set up you have. This means that you won’t have problems with finding the space for your air pad in your pack. This air pad also has an attached pillow. You will have to manually inflate the pillow, but it can make camping a little more comfortable when you’re out in the woods. Even if you’re not going camping, it can mean that you won’t have to pack quite as much stuff as you would otherwise need. This pad is a little bit longer and wider. This means that you’ll be able to sleep comfortably on top of the air pad without feeling like you are going to fall directly off the surface. Another interesting feature is the fact that these air pades have snaps along the sides. This can make rolling it up easier, but it can also make it extremely easy to attach multiple pads together. This is great if you are going camping with a significant other. Finding the best self-inflating air pad is a little bit of a process. It will rely heavily on the setup that you have when it comes to setting up the self-inflating air pad and where you are going to be. If you are uncertain about what you’re going to be doing, then err on the side of caution. While it might be thicker and harder to travel with, it can help you when you aren’t sure about where you are going and what you are doing.